With the rising incidence of mental ill-health regularly dominating our headlines there’s rarely been a greater need to talk. 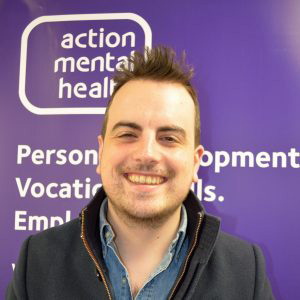 And as we mark #Time to Talk Day, Action Mental Health is delighted everyone’s attention is being drawn to the importance of smashing the stigma of mental ill-health. Talking therapy has long been key to many people’s recovery from periods of mental health difficulties and is one of the Five Ways to Well-Being – ‘Connect’. 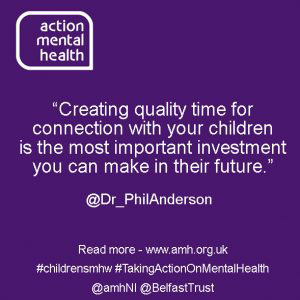 It is also one of the areas covered by Northern Ireland consultant psychiatrist Dr Phil Anderson who, during Children’s Mental Health Week this week, (February 4 to 10) has focused on this area in a series of articles written especially for Action Mental Health. Relationships are the most important way through which children can develop resilience to cope with the stress that life can throw our way. Creating quality time for connection with your children is the most important investment you can make in their future. However, this can be a real challenge, with the ever increasing work demands and the increasing financial burdens placed on families today. However, children’s ability to regulate their emotions is not something that neither happens in a vacuum nor mysteriously appears in a crisis. It happens through the connection of a nurturing relationship with an ‘attuned’ parent. Attunement describes how reactive a person is to another’s emotional needs and moods. A parent who is well attuned will respond with appropriate language and behaviours based on their child’s emotional state. We can only learn to become attuned by getting to know our children’s particular ways of being and communication. This can only be achieved by giving our children our attention and validating their contribution to solving whatever the problem may be. By giving children a safe ‘connection space’ to talk about their feelings and in turn give reassurance about whatever is causing them distress – we can help ‘co-regulate’ their emotions – which in time they develop the internal tools to regulate themselves. Dr Daniel Siegel, Professor of Child Psychiatry at UCLA, states in his book, ‘No-Drama Discipline’, that ‘for a child…it’s extremely powerful to hear someone say, ‘I get you… I understand. I see why you feel this way.’ This kind of empathy disarms us. A key part of building connection is through the sense of ‘touch’; the reassurance from a parents hug can help a distressed child to regulate distress. Human physical contact releases the ‘good-feeling’ hormones such as serotonin that can help us to feel calmer. Neuroscience has shown that in, particularly early childhood, physical contact from our parents or carers, is essential for healthy brain development and emotional health. Professor Francis McGlone, a leading researcher on the biology of touch, has said ‘touch is not a sentimental human indulgence, it’s a biological necessity.’ However, western cultural trends have resulted in some parents and carers feeling increasingly hesitant about physical contact and children may be experiencing less physical contact than ever before. Dr Rangan Chatterjee, GP and author of the recently published ‘Stress Solution’ book, recommends that parents regularly hug their children and encourages the use of play fighting with older children. Modern life, particularly with the rise of social media and video gaming, can cause so many distractions that can get in the way of parents spending quality time with their children. Rather than simply outright banning these modern distractions, they can perhaps be used as opportunity to meet the young person in their environment and let conversation flow, for example, playing video games together. The potential day-to day opportunities for this are endless and can include; grocery shopping, making dinner and walking the dogs. Whatever way it works to bring this ‘connection space’ in your family, the key message is it feels safe, regular and reliable to the young person. Connection is a conduit for compassion. Young people often model the ways their parents or carers connect with others. To this end, showing compassion in connection and helping others has been shown by research to strongly promote resilience and emotional health. Dr James R. Doty, Clinical Professor of the Department of Neurosurgery at Stanford, says that being compassionate is our default mode and this is impaired by the chronic stress of modern life. He says ‘when someone acts with compassionate intention it has a huge, huge positive effect on their physiology’ releasing calming body hormones. Demonstrating compassion and volunteering to help others, can allow your child to model these behaviours and build resilience throughout their life.